Turksat-4B is a Geostationary Communications Satellite operated by Türksat AS, Turkey and built by Mitsubishi Electric, Japan under a $571 Million deal that was signed in early 2011 and includes the development of two satellites – the first of which, Turksat-4A, was launched successfully by a Proton rocket in February 2014. 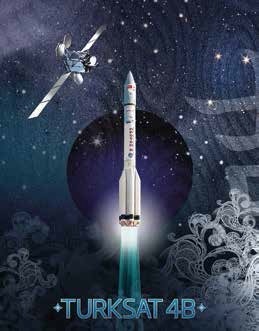 The two satellites will enable Türksat AS to provide telecommunication services as well as Direct-to-Home television broadcasting throughout Turkey as well as broad regions of Europe, Central Asia, the Middle East and Africa. The 4B satellite will be mainly used in Fixed Satellite Communication services via Ku- and C-Band and broadband connectivity and data services in Ka-Band. The satellite is based on MELCO’s DS-2000 satellite platform that made its first flight in 2002 and is known for its excellent reliability. 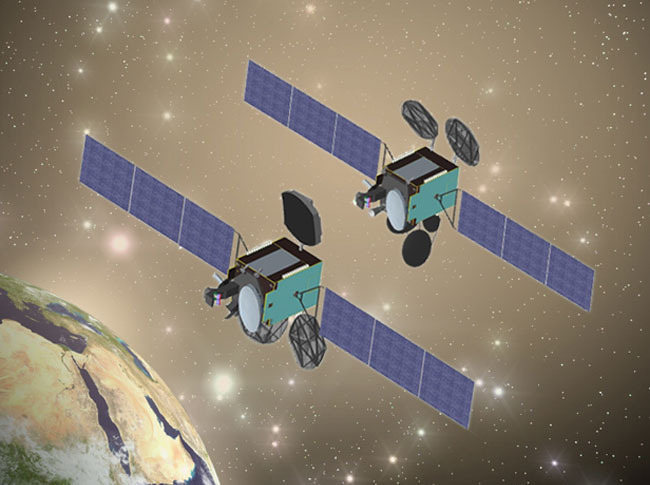 The platform is capable of hosting the most powerful communications payloads up to a payload power of 15 Kilowatts. The satellite is equipped with two three-panel solar arrays that deliver power to dedicated avionics that distribute electrical power to all satellite systems via a regulated 100-Volt main bus. A 175 Amp-hour battery is used for power storage. 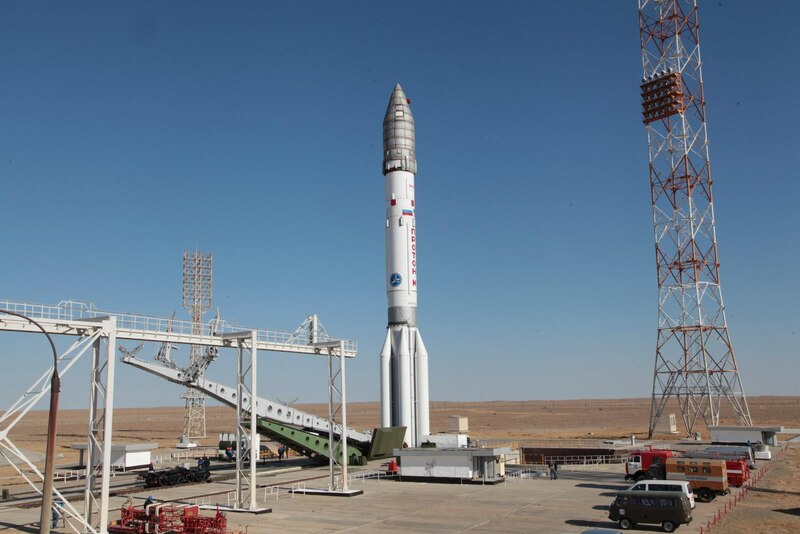 The satellite consists of an internal cylinder that builds the load-bearing structure of the satellite and facilitates propellant tanks inside and a structural network of struts and panels made from Aluminum skin Carbon-Fiber-Reinforced Plastic. The spacecraft uses a bipropellant propulsion system featuring an apogee kick motor plus 12 thrusters for attitude control and stationkeeping maneuvers. Attitude determination is accomplished by a Star Tracker and Inertial Reference Unit as well as Coarse Sun Sensors used during initial acquisition and safe mode. Using a Reaction Wheel Assembly consisting of four wheels, the satellite has a pointing accuracy of 0.03 degrees for precise Earth-oriented operation. 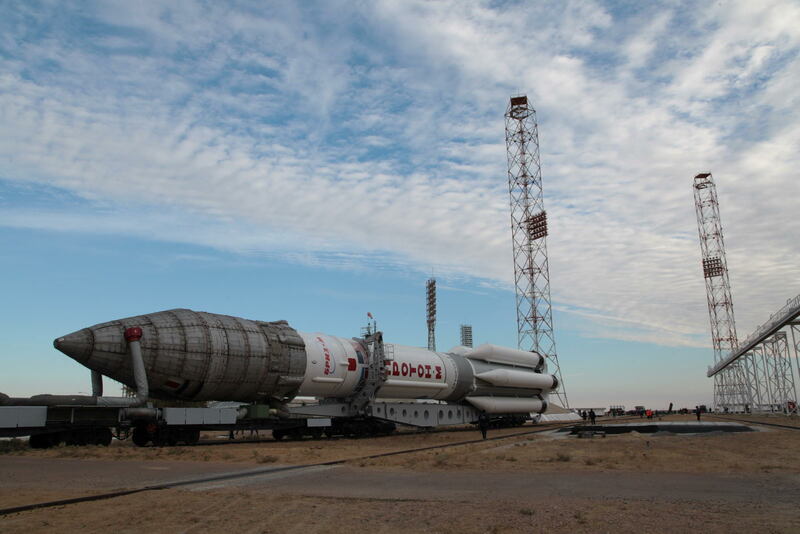 Thermal control equipment on the satellite includes external radiators and internal heaters to maintain an operational environment for all satellite components. 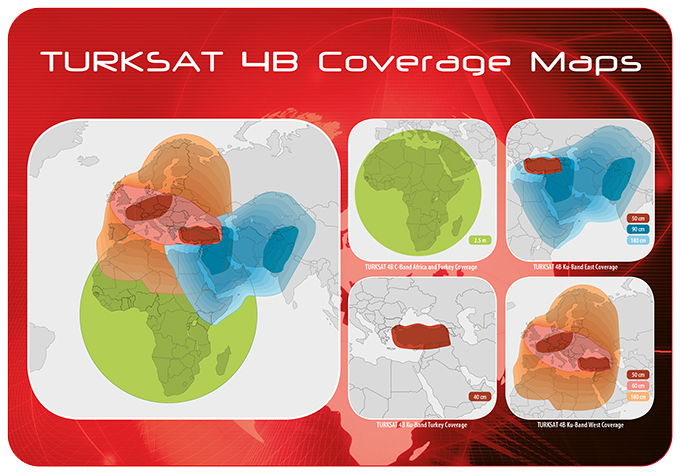 Turksat-4B is equipped with a Ka, Ku, and C-Band communications payload facilitating 43 transponders. The satellite hosts a 1.6-meter Ku-Band array antenna on its Earth-facing panel plus two reflector antennas 2.5 and 2.2 meters in diameter, respectively. A single global C-Band feed antenna can be found on the Earth-facing deck of the satellite. Three Ka-Band antenna reflectors are installed on the satellite, two 1.6 and one 1-meter parabolic reflectors. The satellite has a total launch mass of 4,977 Kilograms and spans 25.3 meters from tip to tip when fully deployed in orbit. It will operate from a position of 50° degrees East in Geostationary Orbit for an operational life of at least 15 years and has a propellant supply lasting at least 20.